Banana Don Jefferson and Stephanie McCoy have been making listeners laugh since the dawn of time. (Or at least since 2002.) Your guess is as good as ours as to what will happen on the show. You’ll just have to join us each weekday morning from 5:30am until 10:00am to find out. 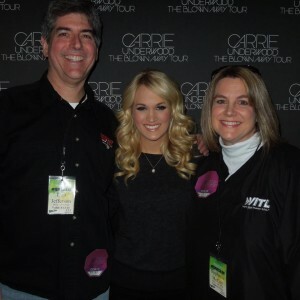 Banana Don and Stephanie McCoy with Carrie Underwood at the Breslin Center. Banana Don and Stephanie with The Band Perry at the Jackson County Fair. Here's the ticket info you need for the show. All humans and animals are welcome. Walmart is trying to cut down on the plastic.